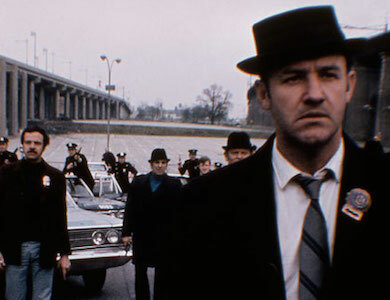 Cinema in the late 1960s and ‘70s shifted focus as art gave way to grit and finesse to muscle. Salt-of-the-earth seasoned many films, echoing society’s search for identity through the volatile time. Film and television couldn’t get enough of the urban cop grinding it out on the streets, or the screwball antics of America’s good ol’ boys. Going for a “walk around the block” in my wing of the hospital, you could hear the sounds of the tiny television sets that hover on arms next to the beds. In one room, I heard a hospital drama …while in the hospital. I’m not that guy, I need some vigor to recover, the kind of energy that can only be served up by cars that don’t get their juice from a power outlet and men who wore hats and threw down in turtlenecks. Tough guys like Steve McQueen and Gene Hackman and slick-talkers like Michael Caine and Burt Reynolds. Some would say the best ten-and-a-half minutes of a car on film—Bullitt not only takes the top spot for the car chase on my list but is also the best film of the bunch. 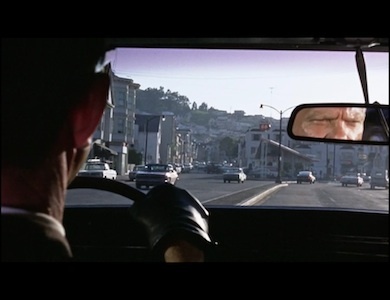 Filmed on the hills and streets of San Francisco, the city, like the 1968 Fastback Mustang becomes a character in the film. Detective Bullitt, played by Steve McQueen, is pursuing a henchman in a Dodge Charger R/T and his cool-as-a-cucumber character is punctuated by the kinetic, visceral driving. Much of the chase is filmed point-of-view from inside the cars and low to the ground when outside, putting the viewer right in the thick of it. Director Peter Yate’s style really shines here as cars dip below the horizon line, popping out and flying as only Detroit metal can. If you are looking for a great thriller and the coolest cat in a car, Bullitt is your huckleberry. A 1971 LeMans is certainly not going to be high on the list of anyone’s choices for a badass car chase, but the director, Friedkin, proves that great cinema is often about tension, loading each frame of cellulose to the brim. Detective “Popeye” Doyle commandeers the LeMans and proceeds to chase a French goon riding an elevated subway in Brooklyn. More of a pursuit, the lack of an antagonistic second car forces the perspective to what is in front of us, instead of what is behind. Supposedly filmed in excess of ninety miles per hour at times, the feeling of the chase is constrictive and out-of-control, weaving through and going against traffic, narrowly missing the occasional bystander and surviving a sideswipe. The chase, like the film, has you on edge and when Popeye gets his man, it is likely you’ll exhale for what feels like the first time in minutes. If the perfect heist requires nimbleness more than muscle, an Austin Mini Cooper will not only fit the bill but make a statement at the same time. 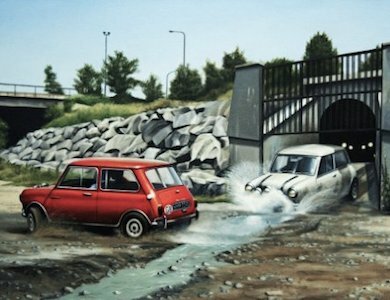 In the Italian Job, the cars become characters, developed over time and given their moment to shine—weaving through palazzos, circling on rooftops, careening across rivers and through sewers. Indeed, Charlie Croker’s plan would not have succeeded without the Austins, though it has been reported that Fiat offered unlimited cars and a sum of money to replace them, with the filmmaker’s refusing on the grounds that the film was decidedly English. True to those words, the style of the film, like many other British/US genre counterparts, is more caper than a thriller, with a lot of humor and wit. This car chase is the most clever, the most precise and the most fun to watch. The remake of this movie is a bit of a different animal but also features the Mini, in it’s latest form. While still clever and fun to watch, it lacks the soul and a sort of grit that the original chase has. Pontiac could probably measure the return on investment for the Trans Am as the Bandit even as it tried to milk the name into the late 90s. Smokey and the Bandit was the second highest grossing film of 1977, being eclipsed only by a little film called Star Wars. On a mission (mostly for the money) to bootleg some Coors beer (speaking of brand boosts) from Texarkana to Georgia in less than twenty-eight hours, Bo Danville, played by none other than Burt Reynolds, gets chased by everything resembling a man of the law. 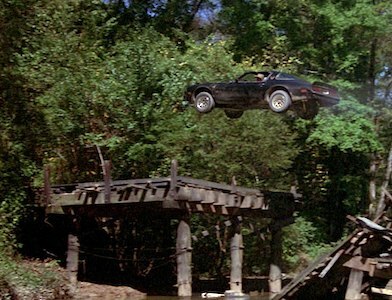 No one pursues with more vigor than Buford T. Justice in our second Pontiac LeMans on this list, and his son, whose bride-to-be (played by Sally Field) just happened to be picked up off the side of the road by the Bandit. While Smokey and the Bandit isn’t the best film here, the comedy is spot on and the banter-driven chemistry between Field and Reynolds is great. Toss in some incredible driving and stunt work and you’ll find that Smokey is a heck of a good time. The only time in history a car has gotten top billing in the film, the original Gone in 60 Seconds proves that a really great chase can actually save a really bad movie. 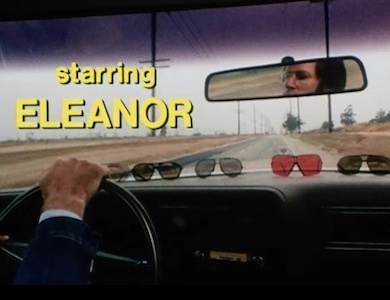 Eleanor is the movie. The rest of the “plot” was clearly made up as a way to loosely string something together to arrive at a nearly forty-minute chase in yet another Mustang Fastback. The car was actually a 1971 Mustang gussied up to look like a 1973 Mustang, for reasons most likely known only to the writer, director, star and stunt man, H.B. Halicki. It doesn’t seem like a thirty-plus minute car chase could really hold your attention, but Halicki bucks that pretty quickly with inventive stunts, fast driving, comic relief, and some really clever “gotchas”. The remake of this movie had some great driving and incredible stunts (and strangely is a much better movie), but there is something about the coordination and scope of the full chase in the original that lands this movie in our final slot for muscle driven speed.